You’ve got to love being in a cinema, watching a documentary that has such amazing twists and turns that the entire audience gasp in disbelief. The Imposter provoked exactly this reaction. From the start, you know it is not going to be a straightforward story, but it just gets stranger and stranger as the film progresses. It is set in Spain and the US. Three years after a 13-year-old boy disappears from his hometown in Texas, a call comes from Spain advising the family that he has been found. However, as we know from the title, it is not their son. It is a 23-year-old Frenchman. The sister of the missing child flies to France(this is where it gets really crazy) positively identifies him, and takes him home again. What? You may be thinking. And that is pretty much what everyone thinks, the whole way through the film. It’s fabulous. See it. 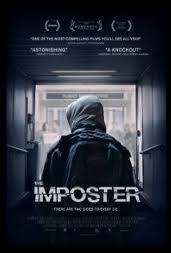 The Imposter won won a BAFTA for Outstanding Debut by a British Writer, Director or Produced and was nominated for a BAFTA for Documentary.